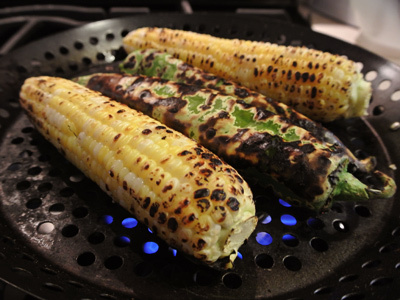 August means it’s “Hatch” season. The first green chile have arrived but I haven’t found any roasters set up yet so I just picked up a few to get started. The first thing I wanted to make was some salsa so I went to the farmer’s market to pick up fresh tomatoes. But as usual I get caught up in all the fruits and veggies and picked up some zucchini and corn too. 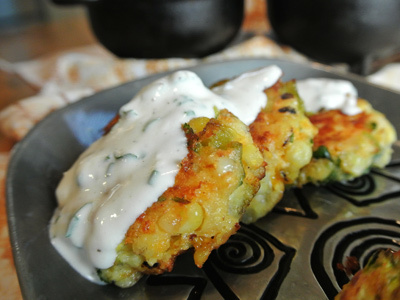 I had recently been drooling over a post from Kevin at “Closet Cooking” for Jalapeno Popper Corn Fritters which gave me the idea to make fritters with the Hatch green chile. 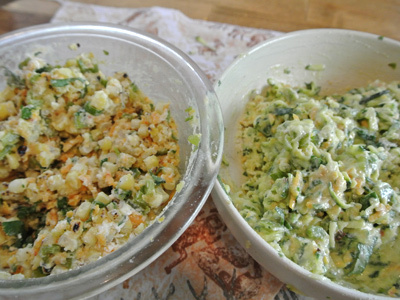 I tweaked the recipe a bit and made a zucchini version too. I topped them with some Fire Roasted Salsa and Flamethrower Sauce. They were quite filling and really tasty, enough to make a whole meal out of them. For the corn fritters I roasted 2 ears of corn and 1 Hatch green chile, added some green onion, cilantro, chipotle cheddar cheese, cream cheese, an egg, Hatch red chile flakes, salt and lime juice. 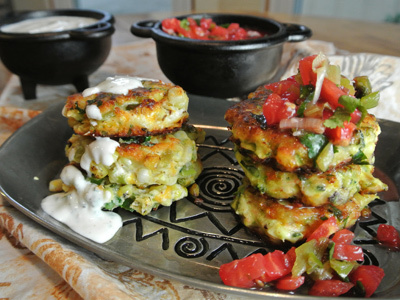 For the zucchini fritters, just sub out the corn for a small zucchini. 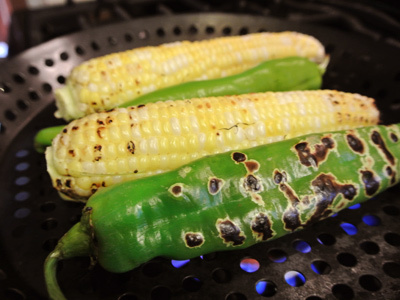 It was raining outside and no way to roast my chiles and corn outdoors/ I improvised and set my grill pan over an open burner on the stove. You need to constantly turn them as they car quickly. The chile’s need to steam in a zip lock bag for 20 minutes. Once it’s properly steamed it will be easy to peel under running water. 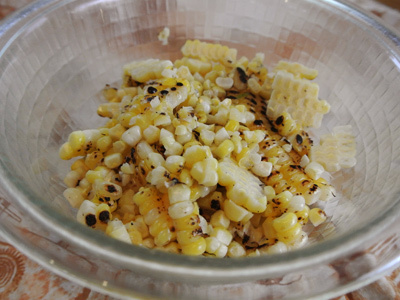 Cut the corn from the cob, you should have about 1 cup give or take. 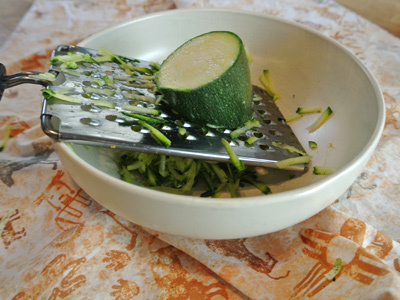 Grate the zucchini, this one made about 1 1/2 cups. 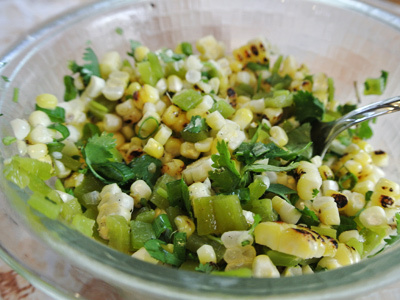 Add the chopped green chile, cilantro, green onion and lime zest. 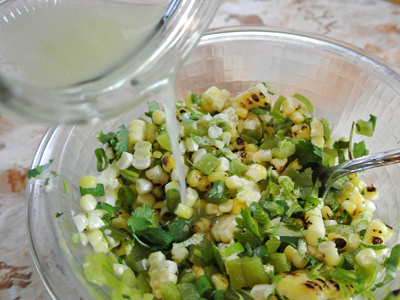 Looks so pretty all stirred together, almost like corn salsa. Add the juice of 1/2 lime . 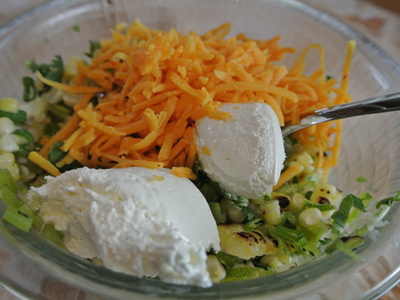 . .
2 tablespoons of cream cheese and grated chipotle cheese. . .
an egg and some Aleppo pepper. 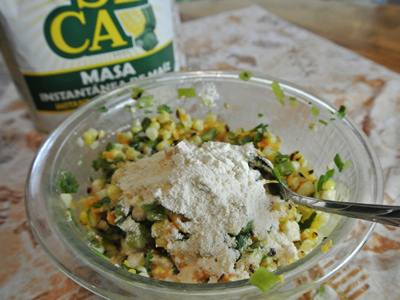 Mix it well and then bind it together with the masa flour. 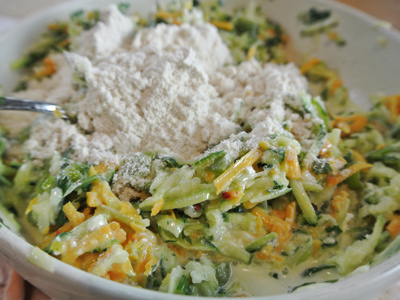 Do the same with the zucchini batch. Place about 1/4 cup in your hands and form into patties. I added enough oil to the pan to coat the bottom. 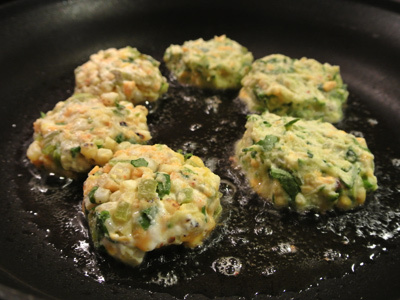 Heat up the pan over medium high heat and set the fritters in to cook 3 – 4 minutes on each side. Once these come out of the pan, just add enough oil to coat the pan and pan fry the next batch of fritters. 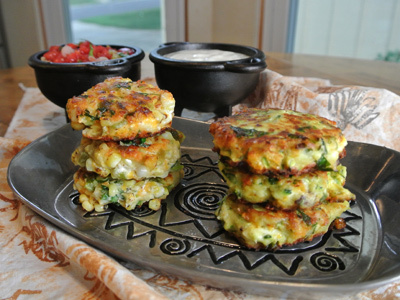 I had enough to make 9 corn fritters and 10 zucchini fritters. Actually the zucchini fritters spread out just a bit more than the corn, I think they had a bit more moisture and that was the difference. My go to sauce is the Flamethrower sauce, it’s so tangy good with these corn fritters. 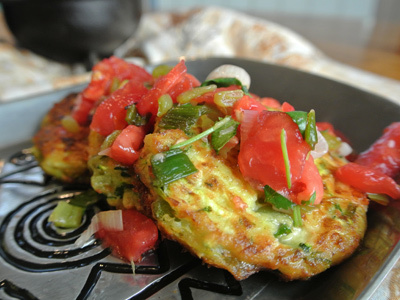 Or you can’t go wrong with some Fire Roasted Salsa for the zucchini fritters. 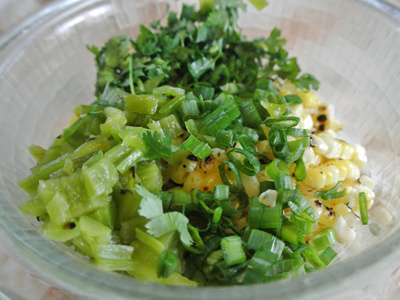 Mix together the corn or zucchini with Hatch chiles, green onion, cilantro, lime zest and juice in a bowl. 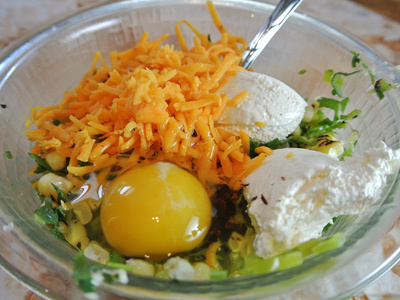 Add in the grated cheese, cream cheese, egg and Hatch red chile flakes. 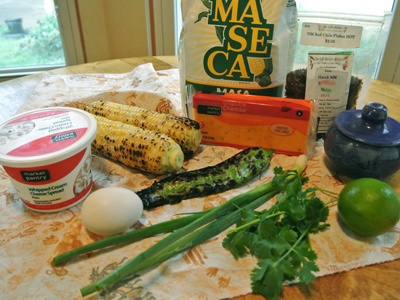 Lastly add in the masa flour. Make sure to add enough flour that you can form patties in your hand. Heat a pan over medium high heat with enough oil to coat the bottom of the pan. 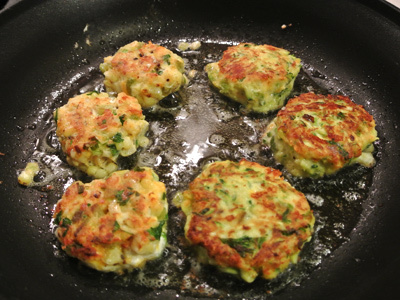 Place patties in the pan and cook about 3 – 4 minutes on each side or until both sides are crisp and brown. If cooking in batches, add enough oil to coat the pan before adding the next patties. These sounds divine Jan! I love fritters of any kind. YUM! Thanks, I have to have them at least once during the summer!